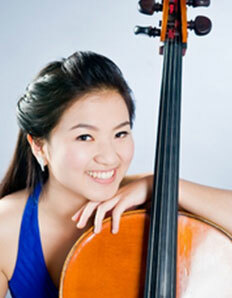 Taiwanese-American cellist Grace Ho is an active soloist and chamber musician in the United States and Asia. Ms. Ho has appeared as a soloist with orchestras including the Xiamen Philharmonic Orchestra (China), Ho Chi Minh City Symphony Orchestra (Vietnam), Sun Taipei Philharmonic (Taiwan), Lewisville Lake Symphony Orchestra (Texas), Manhattan School of Music Philharmonic Orchestra, and University of North Texas Chamber Orchestra. In 2014, Ms. Ho was appointed Guest Principal Cellist of the Miami Symphony. Ms. Ho has achieved numerous awards including First-prize winner in the Manhattan School of Music Eisenberg-Fried Concerto Competition in 2011, winner in the University of North Texas Concerto Competition in 2007, and a silver medal recipient in the Crescendo Music Awards in 2007. Ms. Ho has performed in prestigious concert halls such as Carnegie Hall’s Stern Auditorium and Zankel Hall in New York, Meyerson Symphony Center in Dallas, Taiwan National Concert and Recital Halls, and the Opera House in Ho Chi Minh City. Ms. Ho is a founding member of the Ulysses Quartet based in New York City, a member of Shattered Glass, a conductor-less string ensemble, and a board member of the International Chamber Players, an organization that brings leading American and international musicians together for chamber music concert tours. Ms. Ho received her Bachelor of Music from the University of North Texas and Master of Music from Manhattan School of Music with full scholarships, graduating with the Pablo Casals Award, and is currently pursuing a Doctor of Musical Arts at Manhattan School of Music with full scholarship. Former teachers David Geber, Clive Greensmith, Bonnie Hampton, and Eugene Osadchy.